IMG_2069, originally uploaded by sylviecola(trying to catch up.). This is a new girl I sneaked in some time to work on. She’s a custom Primadolly Winsome Willow. As her name suggests, her face is covered in freckles. She doesn’t like to wear make-up but I managed to convince her that some blush and lip gloss would look nice. Of course, it had to be flavored lip gloss. I gave her this girlie haircut, four new sets of eye-chips and she’s been gaze adjusted, boggled and sleep eyed. Her eyelashes match her hair color. I’ll probably make her available soon. She’s kind of irresistible. Just deciding on what to dress her in. For some reason I’m thinking Brady Bunch but that’s because Winsome Willow reminds me of Marsha Marsha Marsha when her hair is uncut. She does have that 70’s look about her. 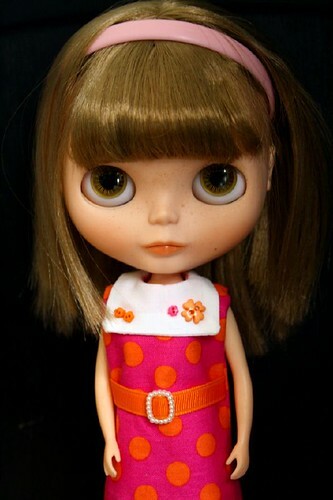 This entry was posted on March 31, 2010 at 7:50 pm and is filed under blythe, Custom Dollies, Dolls, reroots. You can subscribe via RSS 2.0 feed to this post's comments. Oh yeah, I forget what she looks like. Her hair was curlier wasn’t it? But she was freckled face like Frankie. Oh gosh, she’s so adorable! Beautiful!! She’s very cute. I like her dress.